Image via AP. 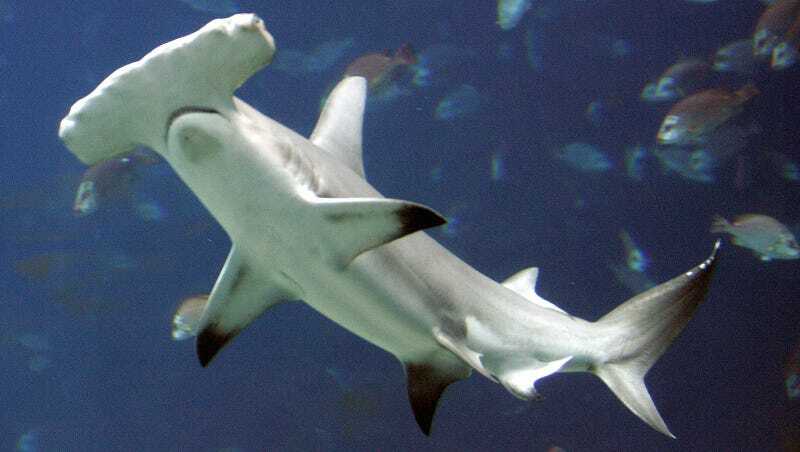 Caption: A hammerhead shark swims in a large tank at the Georgia Aquarium, in Atlanta, in this Oct. 27, 2005 file photo. Female sharks can fertilize their own eggs and give birth without any sperm from a male shark, according to a new study into the asexual reproduction of a hammerhead in a Nebraska zoo. The joint Northern Ireland-U.S. research, being published Wednesday, May 23, 2007, analyzed the DNA of a shark born in 2001 in the Henry Doorly Zoo, in a tank with three potential mothers, none of whom had contact with a male hammerhead for at least three years.